This is long overdue, but I finally de-cluttered saved eBay searches quite a bit. Tired of seeing certain sellers spam the hell out of a category or keyword with scams? Yeah... that's an Old Glory Ice Troll. Still in production. A pack of 4 different figures (I spotted three of them from this pack in one of my searches) will set you back $18 direct from the manufacturer. Or $10.80 if you're an Old Glory Army member. You can order all you like. The staff at Old Glory are really helpful. If you wanted to get 1000 of these "Rare" figures cast up, I'm sure they'd be happy to oblige. So you can get them as easy as that for $4.50 (or less!) each. 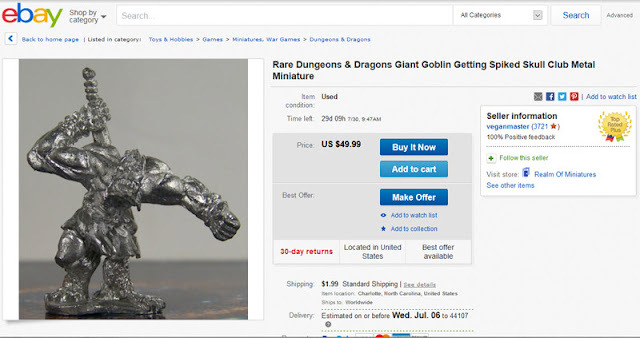 This particular seller spams eBay with thousands of "Rare" figures like this... still in production, but at big mark-ups. The same unsold crap posted over and over again... for years. If they want to prey on unsuspecting buyers, that's their business. Sleazy business, but theirs. My own concern is that I don't want my followed search results to be cluttered with hundreds of their garbage ads. 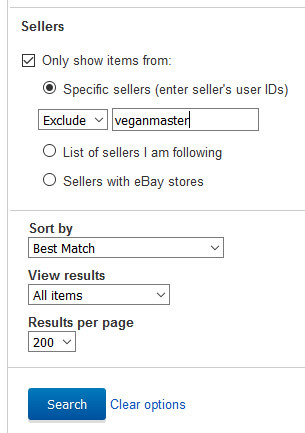 By default, you can search within a single seller's listings. But you can reverse that in the pull-down menu to exclude a seller. I haven't tried it, but I'm guessing you can add multiple sellers using commas. But for now, there is only one douchebag seller that I need to block to cut out about 90% of the spam I see on eBay. Top tip. I was unaware of this. I also have your shirt. Cool! Let me know how to arrange payment/shipping. I just messaged you on facebook with the details. If that doesn't work I'll use your contact form. That's awesome! I will be giving this a look. Yeah, I pulled him up on that a few years ago. Trying to sell the old jabberwocky as a rare mini, when you can buy it brand new from Ironwind minis! I thought he was unaware of it, but it turns out he knows full well what he's doing. Glad your naming & shaming him. Now I know, and I having been ebaying for over ten years.